Until now, our industry has relied on anecdotal evidence to demonstrate that implementing Lean in design and construction results in improved project outcomes for owners, designers and all project team members. Now, two LCI-funded research efforts bring empirical evidence showing projects with a high Lean intensity are more likely to be completed ahead of schedule, under budget and to the owner’s satisfaction. 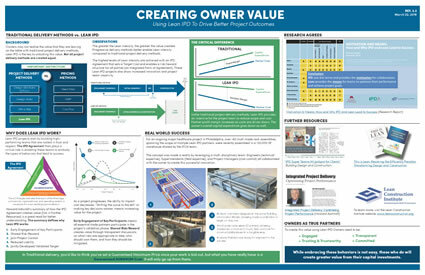 Click below to explore videos, one-page fact sheets and full case studies that build a Business case for Lean design and construction. Share this with your organization, team or with those skeptical of the Lean advantage. The most recent research from 2017 focused on identifying how design professionals can improve client outcomes and maximize design excellence. This study was conducted as a follow-up of the previous effort that uses a similar methodology of comparing best vs. typical projects. Design firm-relevant metrics were examined to establish a benchmark of performance and to reveal the impact of Lean methods. The video featuring designers who tell what the research means to them and the one-page fact sheet below will form a Business case for Lean in design. LCI’s first research effort in 2016 funded two studies that collectively examined 162 projects across the U.S. to understand why some projects excel more than others. "Why do Projects Excel? The Business Case for Lean Project Delivery" was conducted by Dodge Data & Analytics. 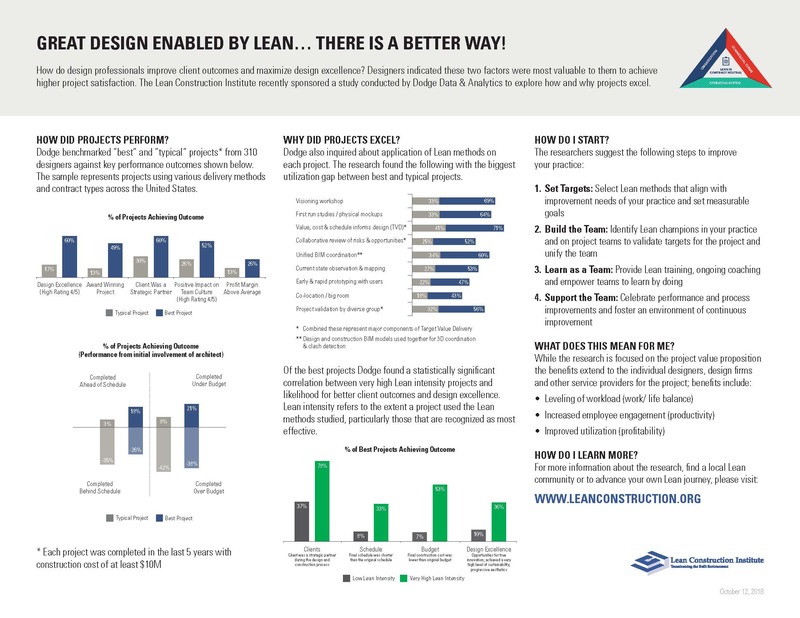 LCI and Canada's Integrated Project Delivery Alliance co-sponsored the "Motivation and Means: How and Why IPD and Lean Lead to Success" study performed by the University of Minnesota, which revealed five myths about Integrated Project Delivery (IPD) and Lean. 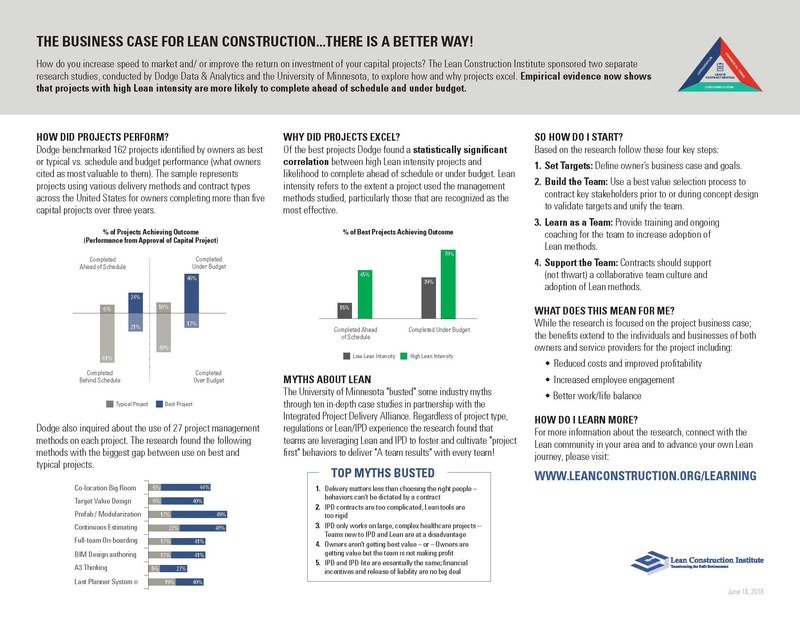 Check out the one-page fact sheet below and watch the three videos to get a high-level look into the research findings that show a significant correlation between high Lean intensity projects and their likelihood of coming in ahead of schedule and under budget. Then, read the research to learn how teams optimize owner and supply chain satisfaction using the IPD model and Lean processes. The Business Case for Lean! The Lean Construction Institute has established a "not to exceed" overhead policy of 20% for academic work in educational institutions funded by LCI. We are a 501(c) (3) not-for-profit organization with a limited annual budget for research-type initiatives. As such, we are responsible to our board, our members and the industry as a whole to ensure our limited funding is devoted as much as possible to the generation of worthwhile research rather than large overhead costs. We also maintain a policy of prompt payment to universities with which we contract in order to help reduce their administrative costs and any overhead burden of monitoring and collecting on invoices generated in connection with research we fund. We also take seriously our mandate to promote lean practices by making our proposal process for scoping and awarding projects as brief and succinct as possible, further eliminating wasted effort and OH costs to our academic institution partners. Watch the owner success story videos below for unscripted responses from several owners who participated in the "Motivation and Means: How and Why IPD and Lean Lead to Success" study. Each owner describes how using Lean and IPD impacted their team, project outcomes and their organization as a whole. If LCI can be of assistance to you in launching or advancing your Lean journey, let us hear from you. The newly developed Practitioners’ Guide to Essential Lean Research helps professionals locate and frame seminal research relevant to challenges they face. Many academic articles can inform specific decisions in the field, but can be hard to find and are not always written with industry practitioners in mind. This map categorizes essential articles and tags them with descriptions and keywords. Covering research from past and current research, it also includes topics that will be critical to the future of our industry such as virtual reality and automation. Get LCI research and other updates delivered straight to your inbox.